The plan announced Tuesday covers seven electrified vehicles to be introduced in the next five years. There will be a fully electric SUV with an expected range of at least 300 miles and a high-volume autonomous hybrid vehicle designed for commercial ride-hailing. It won’t have a steering wheel or a gas pedal. The hybrid version of the top-selling F-150 pickup will be available by 2020 and sold in North America and the Middle East. “Of course it will have increased capability, but what’s really cool is that by electrifying it, it can double as a mobile generator capable enough to power a worksite,” said Mark Fields, Ford’s chief executive. Additionally, Fields said the automaker will scuttle plans for a $1.6 billion factory in San Luis Potosi, Mexico. Instead, it will invest $700 million to transform its Flat Rock, Mich., assembly plant into a factory that will build high-tech autonomous and electric vehicles, a move that will create 700 new jobs. “Our investments and expanding lineup reflect our view that global offerings of electrified vehicles will exceed gasoline-powered vehicles within the next 15 years,” Fields said. Fields said he was encouraged that President-elect Donald Trump and the new Congress have said they will pursue pro-growth economic and business policies. “We believe that these tax and regulatory reforms are critically important to boost U.S. competitiveness and of course drive a resurgence in American manufacturing and high-tech innovation,” Fields said. Ford’s strategy is to focus it electric vehicle development within its strongest segments, which are commercial vehicles, trucks, SUVs and performance vehicles. “Ford is clearly making a play into its heritage of being the dominant commercial vehicle supplier outside of Class 8 trucks in the U.S.,” Mike Ramsey, an analyst at Gartner Inc. told Trucks.com. It is moving forward with plans to create more fuel-efficient and electric vehicles regardless of ample oil supplies. Other manufacturers also are looking at electric commercial vehicles. Mercedes-Benz is considering launching a battery-based Mercedes-Benz Sprinter van around the end of the decade, approximately the same time it plans the next redesign of the large commercial van. “I see there is growing demand in the market,” Volker Mornhinweg, director of Daimler AG’s Mercedes-Benz Vans division, told Trucks.com. Workhorse Group Inc., known for its battery-electric delivery vehicles and aerial drones, said in November that it will begin developing full-size plug-in electric pickup trucks to deliver in 2018 for fleet use. 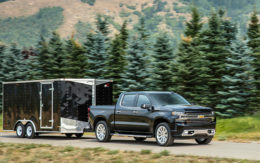 The Workhorse W-15 light-duty work truck, targeted at less than $50,000 before incentives, would be the first of its kind built in the U.S., Workhorse said. North Carolina-based power company Duke Energy has already signed a non-binding letter of interest for at least 500 trucks by 2019. Other electrified vehicles planned by Ford include a hybrid version of the Mustang that the automaker said will deliver V8 engine power and more low-end torque than the current model. It also plans a Transit Custom plug-in hybrid van available to Europe in 2019. It will be engineered to reduce operating costs for business. Additionally, Ford is designing two new, pursuit-rated hybrid police vehicles. Plunging battery prices are behind the push into electric vehicles, said Egil Juliussen, an analyst who follows automotive technology for IHS Markit, an industry research firm. “The operating cost of battery EVs are going down faster than we expected even a couple of years ago,” Juliussen told Trucks.com. Just five years ago, automakers paid about $1,000 per kilowatt hour, or kWh, of power storage in a battery. That’s down to $250 now and is projected to drop to $100 just after 2020, he said. That’s lowering the operating costs of the vehicles to the point where they are starting to make economic sense for commercial operators and will soon be viable for consumers, Juliussen said. Keep me informed, I want a hybrid F159!! Keep me informed, I want a hybrid F150.